Smoky Mountains National Park Fish Finder information. There are 5 species of sport fish that are legal to catch in the National Park. Three of the fish are categorized as trout and two are bass. The national park is huge and due to a wide variety of elevations where fish are found in the park as well as the speed of water in creeks and streams, the waters chemistry, the composition of the bedrock in a stream, surrounding plant life and water temperature each twist and turn can change the distribution of the fish you will find. 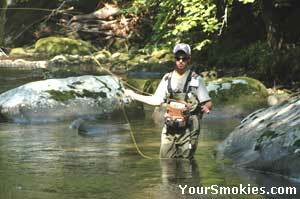 Many Smokies Mountains Fisherman fly fish. Wading can let you cast right where the fish are. There is no single "best place to find fish in the park" as most streams and creeks in the park have been at or close to their carrying capacity of fish for years. Even though fishing can be seasonal, the national park offers great fishing year round. If there is any place in the park to avoid fishing? Unless you are limited by time or your own personal mobility I would suggest staying away from the main roads as to noise of the passing vehicles detracts from the whole quiet relaxing fishing time as well as fishing pressure is highest near roads and parking lots. The best place to fish in the Smoky Mountain National Park really depends on what fish you are looking to catch, the solitude you are looking for and the effort in hiking you are willing to take. Since the national park offers such a wide variety of fishing experiences, I would suggest moving around the park and sampling the fishing in the high elevations creeks and work your way down the large streams all the way to the park borders. Hike along Appalachian Trail which runs along the crest of the Smoky Mountains and you will find small springs that become creeks and streams. Areas of water in the park whose elevation is at 3,000 feet or higher are inhabited mostly by the brook trout which is a native species that is now allowed to be harvested due to the native species restoration efforts. Higher elevation streams are generally steep and thus swift moving. Well shaded by the surrounding vegetation the streams tumble and cascade over waterfalls that are found throughout the park. Hike downstream to the lower elevations and the waters surrounding and nature change as well as the fish you will find. You will now find a few of the non native rainbow trout seeded into the park along with the native brook trout in these steams. Keep on going down the mountainside and you will find more streams joining each other forming slower moving larger waterways working their way down to the lower elevations of the parks. As these streams become larger the makeup of fish in these streams change as the brook trout start to disappear and the rainbow trout as well as the non native brown trout become the dominate fish species. As you are closer to the valleys in the park you will notice that the water has become warmer and more open an the canopy of tress and bushes pull back further to the bank of the streams and no longer completely shade the water. The water has become gentler and slower moving and there are fewer cascades and waterfalls. Since the character of the water has changed as you moved downstream, so have the make of the fish it contains. No longer is the dominate species the brown, brook and rainbow trout. You will now find abundant rock bass, small mouth bass, minnows, shiners, suckers, and darters. Look for deep pools and shaded areas along the banks and you will find where the rock bass and the small mouth bass love to hide. If you want to see all the diverse species of fish found in the park - to date 53 have been recorded, move around the park sampling various waterways in a variety of elevations and water types. Not only will this increase your angling skills, the change in scenery will inspire you to come back to the Smoky Mountains National Park again and again!